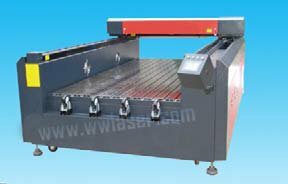 In order to meet the demands of large-area cutting and engraving in marble field, Wisely laser flat bed adopts the system which are used to assure the stability and precision. Open, netty workbench made of stainless steel with high flatness is easy to operate and will never fray. The automatic feeding system is added to save time and cost reduction. Marble engraving industry, advertisement, gift, packing, shoes, garments, toys, model, decoration, arts and crafts, paper industry, etc. Marble, granite, tombstone, wood, acrylic, organic glass, crystal, fabric, paper, leather, rubber, ceramic, glass and other non-metal materials. 1. MY-1121M laser engraving machine is mainly designed for large-size Marble, granite, tombstone or cut non-metallic material. 2. Adopt consolidated flatbed, which can stand 1000kg material. 3. There are wheels on the working table, easy to move heavy material. 4. The height from the laser head to the material is enough for thick material. 5. The height of laser head is adjustable in accordance with different thickness of material. 3.We use the driver, which is the most popular manufacturer of driver in China. 5.We use the latest-version controller MPC6535 and LaserCut5.3.